A traditional Kyrgyz yurt in 1860 in the Syr Darya Oblast. Note the lack of a compression ring at the top. 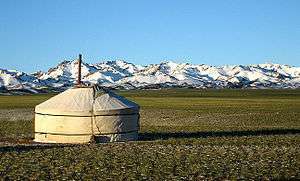 A traditional yurt (from the Turkic languages) or ger (Mongolian) is a portable, round tent covered with skins or felt and used as a dwelling by nomads in the steppes of Central Asia. The structure comprises an angled assembly or latticework of pieces of wood or bamboo for walls, a door frame, ribs (poles, rafters), and a wheel (crown, compression ring) possibly steam-bent. The roof structure is often self-supporting, but large yurts may have interior posts supporting the crown. The top of the wall of self-supporting yurts is prevented from spreading by means of a tension band which opposes the force of the roof ribs. Modern yurts may be permanently built on a wooden platform; they may use modern materials such as steam-bent wooden framing or metal framing, canvas or tarpaulin, Plexiglas dome, wire rope, or radiant insulation. A yurt in Shymkent, Kazakhstan, used as a café. Yurt - originally from a Turkic word referring to the imprint left in the ground by a moved yurt, and by extension, sometimes a person's homeland, kinsmen, or feudal appanage. 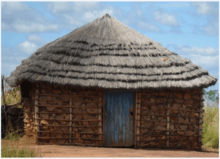 The term came to be used in reference to the physical tent-like dwellings only in other languages. In modern Turkish the word "yurt" is used as the synonym of "homeland" or a "dormitory". In Russian the structure is called "yurta" (юрта), whence the word came into English. гэр (transliterated: ger, [ˈɡɛr]) - in Mongolian simply means "home". 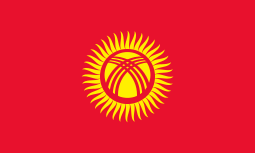 киіз үй (transliterated: kïiz üy, [kiˈəs yj]) - the Kazakh word, and means "felt house". боз үй (transliterated: boz üy, [bɔs yj]) - the Kyrgyz term is meaning "grey house", because of the color of the felt. ak öý and gara öý ([ɑk œj, ɡɑˈrɑ œj] - In Turkmen the term is both literally "white house" and "black house", depending on its luxury and elegance. qara u'y or otaw ([qɑrɑ́ yj, wotɑ́u̯]) - in Qaraqalpaq the first term means "black house", while the second means "a newborn family" and is used only to name a young family's yurt. "Kherga"/"Jirga" - Afghans call them. "Kheymah" (خیمه) is the word for a yurt or a tent like dwelling in Pakistan, from the Urdu (and Persian) :خیمه In Persian yurt is called chador (چادر), in Tajik the names are yurt, khona-i siyoh, khayma (юрт, хонаи сиёҳ, хайма). өг (ög, Mongolian pronunciation: [œk]) is the Tuvan word for yurt. The frame consists of one or more expanding lattice wall-sections, a door-frame, bent roof poles and a crown. The Mongolian Ger has one or more columns to support the crown and straight roof poles. The (self-supporting) wood frame is covered with pieces of felt. Depending on availability, felt is additionally covered with canvas and/or sun-covers. The frame is held together with one or more ropes or ribbons. The structure is kept under compression by the weight of the covers, sometimes supplemented by a heavy weight hung from the center of the roof. They vary with different sizes, and relative weight. Ak Öýi (White Building), "The World's Largest Yurt", located 10 km west of Mary, Turkmenistan, dedicated on November 27, 2015. The wooden crown of the yurt (Mongolian: тооно, [tɔːn]; Kazakh: шаңырақ [ʃɑɴərɑ́q]; Kyrgyz: түндүк [tyndýk]; Turkmen: tüýnük) is itself emblematic in many Central Asian cultures. 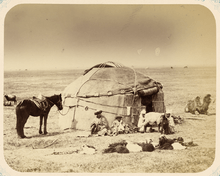 In old Kazakh communities, the yurt itself would often be repaired and rebuilt, but the shangyrak would remain intact, passed from father to son upon the father's death. A family's length of heritage could be measured by the accumulation of stains on the shangrak from decades of smoke passing through it. 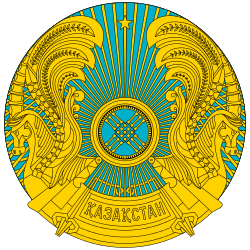 A stylized version of the crown is in the center of the coat of arms of Kazakhstan, and forms the main image on the flag of Kyrgyzstan. 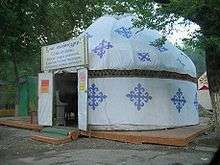 Today the yurt is seen as a nationalistic symbol among many Central Asian groups, and as such, yurts may be used as cafés (especially those specialising in traditional food), museums (especially relating to national culture), and souvenir shops. 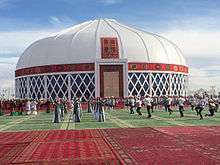 In celebration of the city of Mary's year as Cultural Capital of the Turkic World, the government of Turkmenistan constructed a yurt-shaped structure, called Ak Öýi (White Building) and described as "The World's Largest Yurt", of concrete, granite, aluminum and glass. Dedicated on November 27, 2015, the structure is 35 meters high and 70 meters in diameter. According to the Turkmenistan state news agency, "A white yurt is a symbol of an age-old, distinctive historical-cultural legacy, a sign of preservation of our roots and origins." This three-story structure includes a café, offices, and VIP apartments as well as a large auditorium with 3,000 seats. Enthusiasts in other countries have taken the visual idea of the yurt—a round, semi-permanent tent—and have adapted them. Although those structures may be copied to some extent from the originals found in Central Asia, they often have some different features in their design that adapt them to different climate and use. 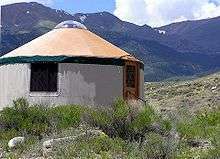 In the United States and Canada, yurts are made using hi-tech materials. They are highly engineered and built for extreme weather conditions. In addition, erecting one can take days and they are not intended to be moved often. These North American yurts are better named yurt derivations, as they are no longer round felt homes that are easy to mount, dismount and transport. North American yurts and yurt derivations were pioneered by William Coperthwaite in the 1960s, after he was inspired to build them by a National Geographic article about Supreme Court Justice William O. Douglas's visit to Mongolia. In 1978, Oregon-based company Pacific Yurts became the first to manufacture yurts using architectural fabrics and structural engineering, paving the way for yurts to become popular attractions at ski resorts and campgrounds. Yurts are also popular in Northern Canada. In 1993, Oregon became the first state to incorporate yurts into its Parks Department as year round camping facilities. Since then, at least 17 other US States have introduced yurt camping into their own parks departments. 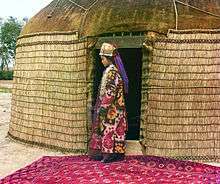 In Europe, a closer approximation to the Mongolian and Central Asian yurt is in production in several countries. These tents use local hardwood, and often are adapted for a wetter climate with steeper roof profiles and waterproof canvas. In essence they are yurts, but some lack the felt cover that is present in traditional yurt. The palloza is a traditional building found in the Serra dos Ancares in northern Spain. Pallozas have stone walls and a canonical roof made of stalks of rye. ↑ van der Haegan, Bernard. "Mongolian ger decoration". Boston Star Consulting. Retrieved 27 October 2011. ↑ "Turkmenistan's Latest Folly: Humongous Yurt". November 3, 2015. ↑ "Концерт мастеров искусств тюркоязычных стран прошел в «Türkmeniň ak öýi»". 28 November 2015.